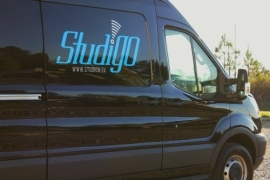 StudiGo offers a mobile live broadcast studio in Washington DC. Washington DC, August 2016: Instead of asking a guest to come to a studio, StudiGo offers to take the studio to the guest. The Washington DC-based company says its mobile live broacast studio takes less than five minutes to set up once it's on site. The StudiGo is equipped with an HD broadcast camera, fixed studio lights, IFB, lapel microphone, and a customizable digital background. You can select from one of the company's images or upload your own. The company, which is new to promoting its services on TVZ, says StudiGo combines the freedom of mobility with the integrity of a professional studio look - at a fraction of the cost.